The first item: Make This List! 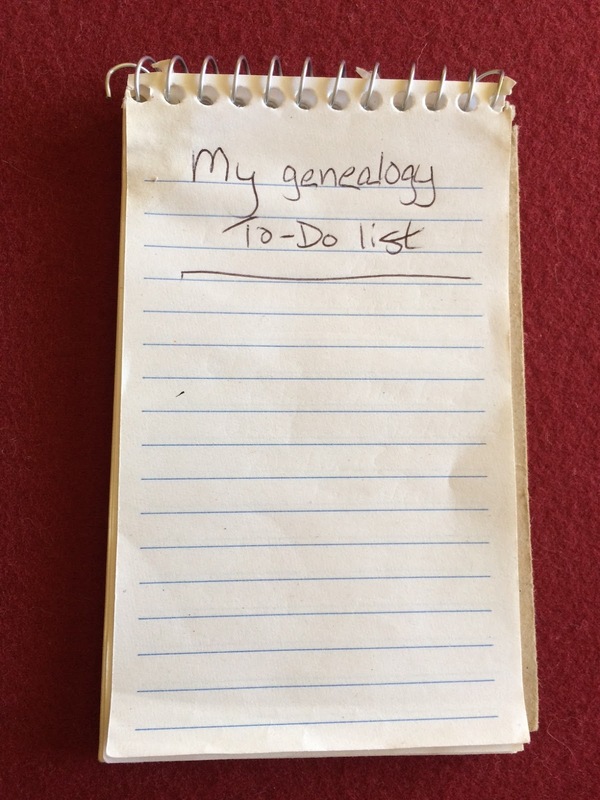 You have so many tasks on your genealogy to-do list. So many threads to follow and weave together. The answer seems like a contradiction. It's a combination of concentration, flexibility, focus, and spontaneity. Concentration to stay on-task and set aside temptations that don't help you with your goal. Flexibility to jump from one branch to another when a cousin asks for your expertise. Focus to complete large tasks that need to get done. Spontaneity to respond to a potential relative and collaborate on their research. 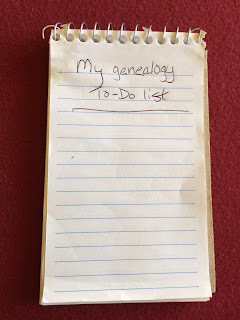 Making progress on each of these tasks helps you make strides in your family tree research. Here are some time-management tips to keep you on track so you never feel overwhelmed by the hobby you love. Make a list of the most important goals for your research. At a high level, what do you want to accomplish? For example, DNA testing tells me that my parents are 4th to 6th cousins. One of my top goals is to find that set of 3rd to 5th great grandparents they share. In all the research I do from now on, finding that couple has to be my top goal. You may have a handful of high-level goals. Put them all in a list and glance at it each time you sit down to do more research. Your list of high-level goals can seem like a pie-in-the-sky fantasy, and not something you can do. Break each goal down into logical, manageable chunks. These individual tasks will look more realistic. And achieving each one will get you closer to that high-level goal. Work to identify more great grandparents, one set at a time. I have tons of Italian vital records I need to search through. Examine the last names of the great grandparents I have identified. Do I recognize any names on Dad's side as belonging on Mom's side? Check the marriage records for some of these couples. My ancestors all come from neighboring towns in Italy. Do any of these couples have a husband or wife who was born in one of those towns but married in another? The out-of-towner may be connected to another branch in my family tree. Clean up your source citations. Annotate the images in your tree. Attach documents, like census forms, to each person in your tree who's named in the document. Find sources for facts in your tree that you forgot to document. Gather the documents that are missing but you know you can find if you keep trying. Untangle and fix the mistakes you know are in your tree. For this list, you need to put aside your flexibility and spontaneity for a stretch of time. Focus on completing or making significant progress on one of these important tasks. You know your family tree will be better for the effort. You want to get these tasks out of the way. So whenever possible, put your blinders on and get to it. Is your family tree online? Have you had a DNA test? If so, you may have had people contact you trying to find a connection. Make a list of these contacts and a description of their family details. I have people who are trying to find a connection based on one last name, or one ancestral hometown. If I have that list handy, I can contact them when I make a new discovery. Don't lose track of those potential relatives. Write down your high-level goals. These will change over time. You may add a bunch more before you cross any off your list. Break down each high-level goal into the steps that can help you achieve those goals. Keep the list updated. Each time you learn something new, this list may change. Examine your family tree and write a list of the clean-up tasks you've been meaning to do someday. The more you do, the more valuable your tree becomes. Go through your email and online contacts with fellow genealogists. Did someone write to you three years ago about a brick wall you just broke wide open? Get back to them! Maybe you're related and can give each other's tree a big boost. Finally, do what works best for you. Some people like a hand-written or printed list. Some like post-it notes on their computer monitor. I'm the type who'll go totally digital. Lately I've added tasks to my tree so they're the first thing I see when I launch Family Tree Maker. Your hours of family tree research are your legacy. Make your family tree a thing of beauty. Like tending a garden, the more work you put into it, the better the harvest.